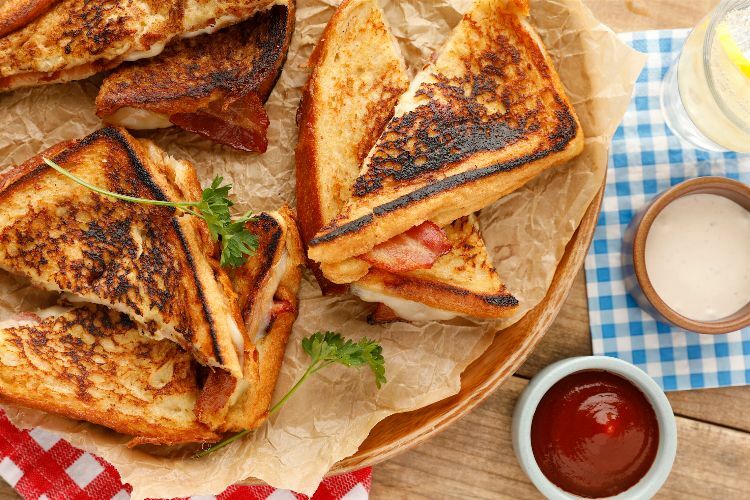 Make all of your brunch dreams come true with this sweet-and-savory combo of French toast and grilled cheese sandwiches! To prepare the recipe below, first you'll soak thick slices of country bread in a homemade custard. 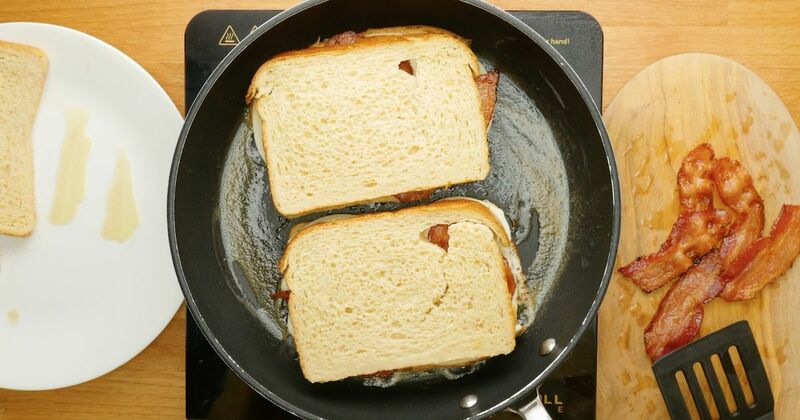 Layer with bacon and provolone cheese, fry in butter, and your sandwiches are ready to serve. True lovers of sweet and savory may like to serve this sandwich with a sweet dip. Maple syrup is an excellent choice to bring out the sweetness of the French toast and the hint of maple on the bacon. Of course, this sandwich is also more than decadent enough to enjoy on its own. Preheat the oven to 400 degrees. Brush the bacon with maple syrup on both sides. Place on a nonstick baking sheet and bake for 20 minutes, flipping once or until very crispy and golden. Set aside on a rack to drain. Whisk together the eggs, milk, maple syrup, and cinnamon. Heat the butter in a nonstick pan over medium-low heat. Dip two of the slices of bread in the custard for a few seconds, until nicely soaked. Place the slices in the pan, and top each one with 1/4 of the cheese and 4 of the bacon slice halves. Cook for 5 minutes, then dip 2 more of the bread slices in the custard, and place on top. Immediately flip the sandwiches over and cook for 5 more minutes on the other side. Remove the sandwiches from the pan and repeat with the other two sandwiches. Serve with maple syrup on the side, if desired.